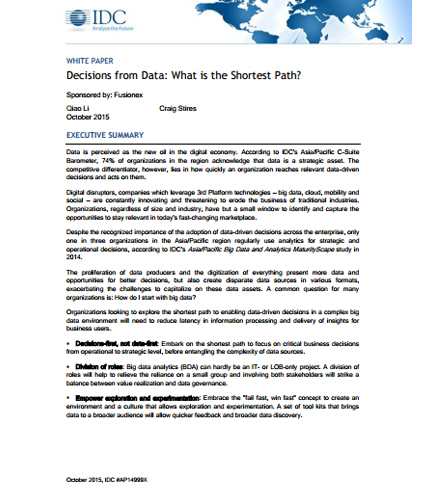 "Big data & Analytics Ecosystem: Decisions from Data"
Decisions from Data: What is the shortest path ? Making data-driven decision in a complex big data environment presents many challenges for organizations . What is driving organizations to rethink new approaches to shorten the path to data-driven decisions making?? What challenges organizations are facing in making data -driven-decisions ? What are the key offerings that address the organizations' needs in this process of driving decisions from data? What are the considerations CXOs need to take into account when implementing infrastructure and tools to support the data-driven decision making path? What are the benefits of leading with data-driven decisions in solving business problems? Big data analytics and the Internet of Things in manufacturing Industry as an end-to-end platform is the critical backbone to enable the vision of smart manufacturing. Smart manufacturing requires IoT-driven data analytics to improve asset utilization and greater efficiency.The application of the Internet of Things to the manufacturing sector signifies huge operational improvements. This whitepaper outlines an Internet of Things (IoT) initiative in manufacturing to show how data analytics applied to factory equipment and sensors can bring operational efficiency. Is the Internet of Things really changing Manufacturing? How Big data analytics in manufacturing can bring cost savings to manufacturing processes? What are the key benefits of manufacturing optimization with the Internet of Things? How to apply IoT in the manufacturing industry's unique requirements? How can Iot help manufacturers to extract maximum value out of their manufacturing data? How can an IoT initiative using big data analytics server and IoT gateway in manufacturing address the challenges? Read this whitepaper to know more about How to Optimize Manufacturing smartly with the Internet of Things (IoT).